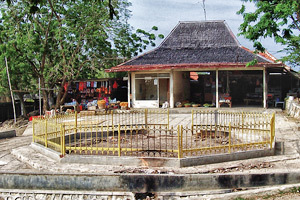 This tourism object is located at Larangan Tokol village, Tlanakan district, about 4 km of Pamekasan city. It’s very beautiful especially during the night. This place has a big sulphur spring and has many natural flame sources that often are beneficial for national sport events. It is a hilly area with beautiful scenery and surrounded by a fertile fruit producing area. This tourism object is ever used to flame the fire of PON that held in 10 November Surabaya stadiums. The west side of this place is a hot water pool, about 100 m by foot. The western of this place there is Ki Muko grave. It was said that his stick can make the beautiful fire by stuck to the ground.